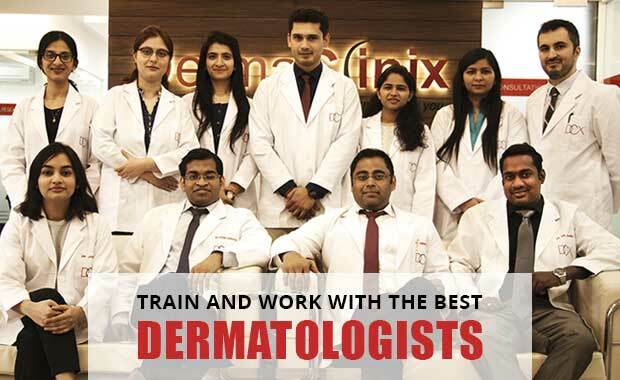 DermaClinix - The complete skin and hair solution center offers ‘FUE Hair Transplant’ training program to dermatologists so as to assist them in mastering the skill of state-of-the-art "Hair Transplantation". This training is given under the supervision of renowned hair transplant surgeons, Dr. Kavish Chouhan, Dr. Amrendra Kumar & Dr. Jyoti Gupta, who have a cumulative experience of performing more than 3000 FUE hair transplants till date. At DermaClinix, we practice hair transplantation using the most innovative techniques and equipment, which means we maintain the Follicle Transection rate >2% and <5% and achieve >95% graft survival consistently. We do 60-80 hair transplants every month. On most days, 3-4 surgeries are being done simultaneously giving an enormous scope of learning. Only qualified dermatologists (MD, DNB, DVL) and Plastic surgeons (MCH, DNB) can apply for Hands-on Training and Fellowship program. For more details, give us a call at +918588827963, +918882227080 or mail at drkavish@dermaclinix.in, and dramrendra@dermaclinix.in . One-day/One-week observership of FUE hair transplant surgery. Discussion with Surgeons regarding the tips & tricks associated with FUE Surgery. Understanding the Basics of Trichology: Anatomy of Hair & Hair Cycle; Hair Loss; Setting up of Trichology Clinic. Regarding selecting a patient for Hair Restoration, Setting up of Operation Theatre & Instrumentation; Follicular Unit Extraction; Implantation, Post operative care, Body Hair Transplants, Women Hair Transplant, Revision Hair Transplant. E-mail assistance for future problems encountered in hair transplantation. 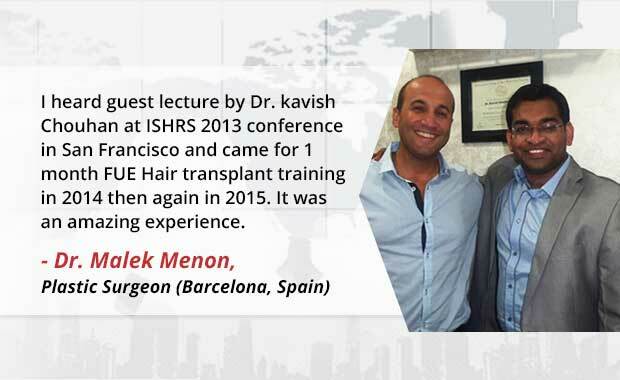 This program is about getting intermediate to advanced level hair transplantation training. It is helpful for existing hair transplant surgeons to polish their skills, and learn about gigasessions with FUE, Hair transplant in Vitiligo, Eyebrow/Eyelash transplantation, Beard/Mustache hair transplant. This program includes 1 Week training, 1 Month training and 3 Months training. It would be observership/ hands-on training, depending on your skills. Discussion with surgeons about the tips & tricks related to FUE hair transplantation surgery. Discussion of the Basics of Trichology: Anatomy of Hair & Hair Cycle, Hair Loss, Setting up of Trichology Clinic. Selecting a patient for Hair Restoration, setting up the OT & instrumentation, Follicular Unit Extraction & Implantation, preoperative and post-operative handling of the patients, and brief practice of special cases like Women hair transplant and Body Hair transplant. Briefing with the basic of Trichology: Anatomy of Hair & Hair Cycle, Hair Loss, Setting up of Trichology Clinic. Selecting a patient for Hair Restoration; Setting up of Operation Theatre & Instrumentation, Follicular Unit Extraction, Implantation, Post operative care; Body Hair Transplants, Women Hair Transplant, Revision Hair Transplant. Hands-on training of extraction of grafts from the models & Patients (depending on surgical skill of the physician). Hands-on training of implantation of grafts in models & patients (depending on surgical skills of the physician). Training on PRP therapy, PRP-A cell therapy & LLLT. Basics of Trichology: Anatomy of Hair & Hair Cycle, Hair Loss, Setting up of Trichology Clinic. Hair Restoration Surgery practice: Selecting a patient for Hair Restoration; Setting up of Operation Theatre & Instrumentation; Follicular Unit Extraction, Implantation, Post operative care, Body Hair Transplants, Women Hair Transplant, Revision Hair Transplant. Hands on training of extraction of grafts on models & Patients. Training on Sales & Marketing of the Clinic & patient generation. This program is a helping hand to those who want to make ‘Hair transplantation’ as their primary specialty. This training session will allow you to learn all the advancements in hair transplantation, and get familiar with the ‘state-of-the-art’ Hair Transplantation independently with consistently good results. The candidate under this program will be on contract basis for 1 year to 1.5 years. The fellowship candidate will have to present seminars and journal clubs on a monthly basis and will have to take part in a research project to complete the fellowship. The initial 6 months will be a training session, covering all the above training program. While, for the next 6 months, you will be allowed to perform surgery independently under the supervision of our senior hair transplant doctors. 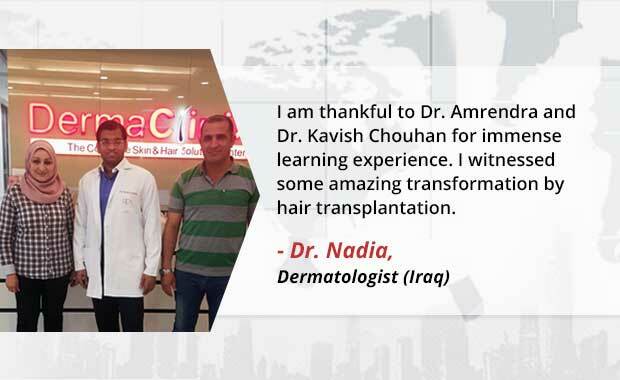 The candidates who will complete the Fellowship Program under the supervision of renowned hair transplant surgeons, Dr. Kavish Chouhan & Dr. Amrendra Kumar will be given a golden opportunity to work as a Consultant Hair Transplant Surgeon at DermaClinix. *This would be subject to approval by Doctors. So, are you ready to get the perks of this opportunity? Apply Now!